Rose’s Alpha Bakers did another bread this week, and it’s another bread that has a pre-ferment. This time, I actually made the biga according to the recipe, instead of using my own starter. This bread’s biga is made with pumpernickel flour, which a number of the bakers had a hard time finding. Fortunately for me, I was able to adjust the granularity on my flour mill, and produce something that (probably) closely resembles pumpernickel flour. Because it’s a stone mill, some of it was pretty fine, and some of it coarser. I don’t think that had any serious impact on the finished bread. It turns out I’m bad at remembering to post, until I go to get myself a snack and think “Oh, right, I’m supposed to blog about these.” I don’t remember what I thought about these cookies the first time around, but I do remember baking them as part of testing recipes for The Baking Bible. In fact, I wouldn’t be surprised if the Lekvar (apricot puree, more or less) that I have in the fridge is from when I was testing recipes. This week, the “alpha” bakers were working on The Ischler. Apparently, this is a cookie that is normally dipped in chocolate, but Rose’s take has an equal amount of chocolate in every bite. You can find the recipe on the blog that Rose has linked to, here. 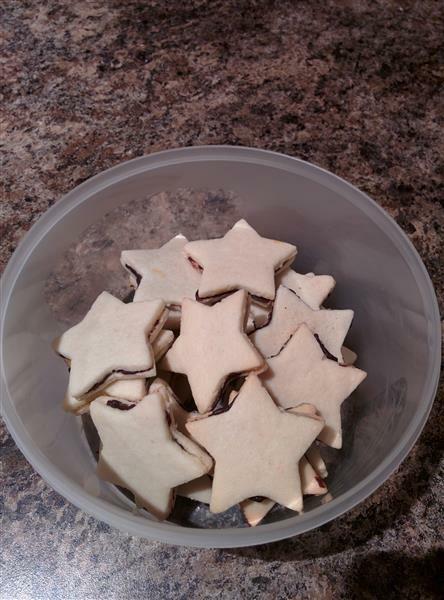 I decided to make mine star-shaped, for more Christmassyness (yes, that’s a word, now). I’ve got another confession to make. Unfortunately, this one isn’t a tasty tip like IKEA chocolate. This one is that I had last week off work, and I still managed not to find the time to write up last week’s cake, from the Heavenly Cake Baker’s group. Last week’s cake was the cranberry crown cheesecake. After all my angst about trying to figure out what should be used for the base, I neglected to post about it after it was baked. In fact, after checking all of my ingredients for their sodium content, picking the lowest sodium cream cheese, lowest sodium sour cream, leaving out the salt, and calculating what the max sodium content might be if I cut it into 12 pieces (about 250 mg, if I did the math right), I neglected to take the cheesecake to my family’s Christmas celebration up at my uncle’s house (about a 1.5 hr drive from our place). Oh well. Here it is, before I forgot it in the fridge. Now let’s talk about this week’s cake.